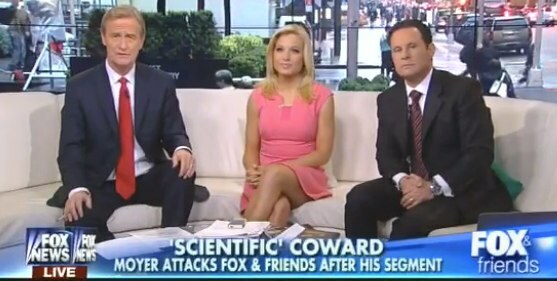 An appearance by a Scientific American editor Michael Moyer, on Wednesday’s “Fox & Friends” morning show has left the hosts of the show and Mr. Moyer hurling insults at one another via every channel imaginable — TV, blog post, Twitter, etc. Then things slowly fell apart. Attention early risers: I’m set to appear on Fox & Friends at 6:20am tomorrow. I’ll be talking about the future. But after the segment, during which his hosts spend an inordinate amount of time musing about whether there may be football on other planets, the frustrated Moyer took to Twitter again, this time outing the network for preventing him from talking about climate change (and also letting some insults fly). Moyer also wrote a blog post explaining the context of his tweets and detailing his side of the story. 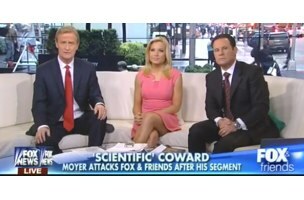 In response, the hosts of “Fox & Friends” used their Thursday show to hit back at Moyer, calling him a “coward,” and showing a picture of his face while the Cindi Lauper song “True Colors” played in the background. The hosts continued to plead their own case and mourn being “stabbed in the back” throughout a segment that lasted about 20% longer than Moyer’s actual appearance. We can’t say anyone involved took the classy route here — but hey, the whole debacle could be seen as a pretty well-timed tribute to “Mean Girls” on its 10th anniversary, so we guess there’s that.